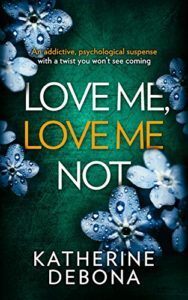 Love Me, Love Me Not by Katherine Debona is a contemporary psychological novel that will have you gripped and guessing from the start. The story is split into ‘now’ and ‘then’ as the reader tries to piece together the action. The tale is about a magnificent obsession – an obsession that will consume and destroy, An obsession that will not let go. An obsession that is stronger than reality. Love is a powerful emotion. It is closely aligned to hate. Love motivates for good or bad. Loss can be overwhelming. “He left a hole in my world where all my love fell through.” How do you continue when love moves out?